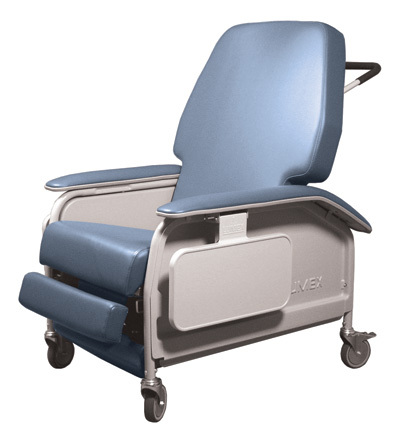 The Extra-Wide Clinical Care Recliner has been designed specifically for the larger resident/patient. The extra-wide seat width of 24" and greater weight bearing capacity enables the recliner to comfortably sit and position patients up to 450 pounds. Four swivel casters facilitate transport and maneuverability in confined areas. Left and right rear top-locking casters provide positive lock. Directional wheel lock on right rear caster reduces “crabbing” of recliner and enables the chair to be moved down hallways with less effort.